Walk white sands, next to shallow blue waters, and notice the growth of luxury resorts in the distance. Fishing boats bring in catches of prawns, fish and crabs, and the cook “curry’s them up” to place onto our plates tonight. Yeah, Babe, we are finally away from the crowds. However, our short attention span kicks-in, and after four days of hot, humid beach, we want to roll. 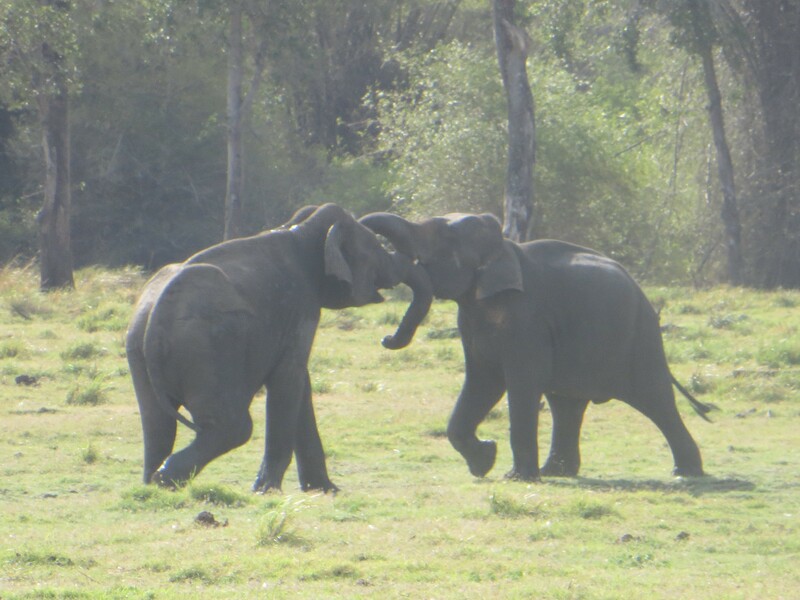 Bring on “The Gathering.” Dahn, our driver, joins us in the safari jeep tour to witness a spectacular event, where over 200 wild elephants migrate to Minneriya National Park. They come to eat the rich grass growing in the mud. 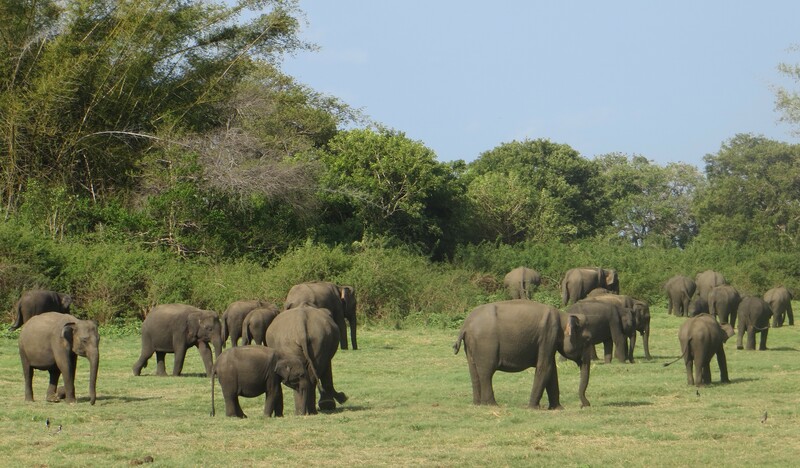 Elephants consume around 300 kilos of grass daily. 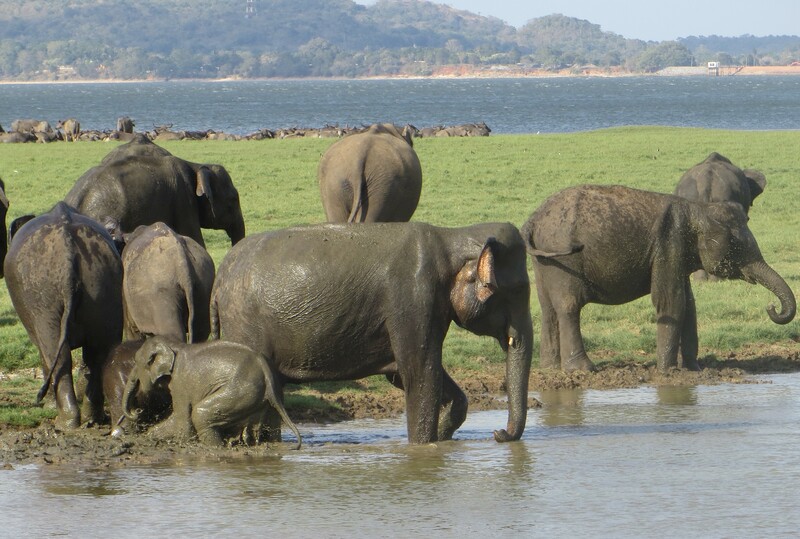 We gaze at the magnificent beasts for hours, before moving on to Sigiriya Rock (Lion Rock). This monstrous volcano plug, flew to flat land from an ancient volcanic explosion. Crocodiles swim in the moat around this rock. Tourists climb up rickety steps to the top, where ruins of either a monastery or a palace remain, depending on which story you believe. 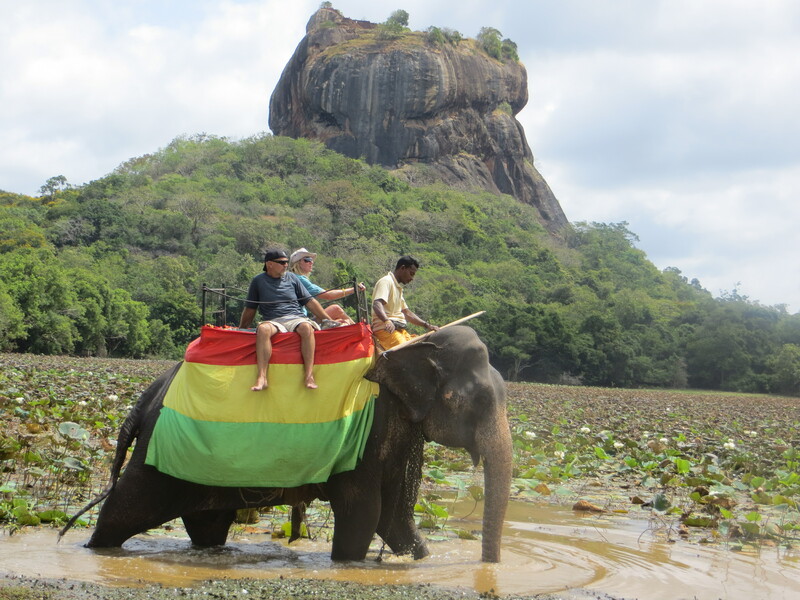 We decide to not spend sixty bucks to climb the steps, and opt to spend sixty bucks on an elephant ride…which is a first for us. Riding on a trained, magnificent beast gives us mixed/sad feelings for the elephant. 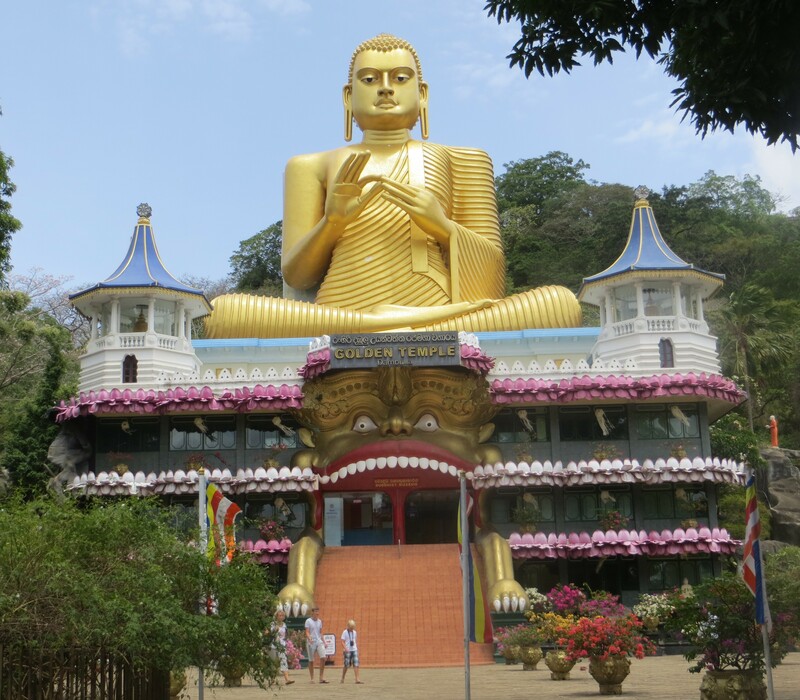 We pass a massive Buddha meditating on a hill in the jungle, exuding friendliness and peace. We can all use more of that. Mare and I spend the night on a balcony guesthouse back in the jungle of Kandy, where birds sing and monkeys wrestle on rooftops. 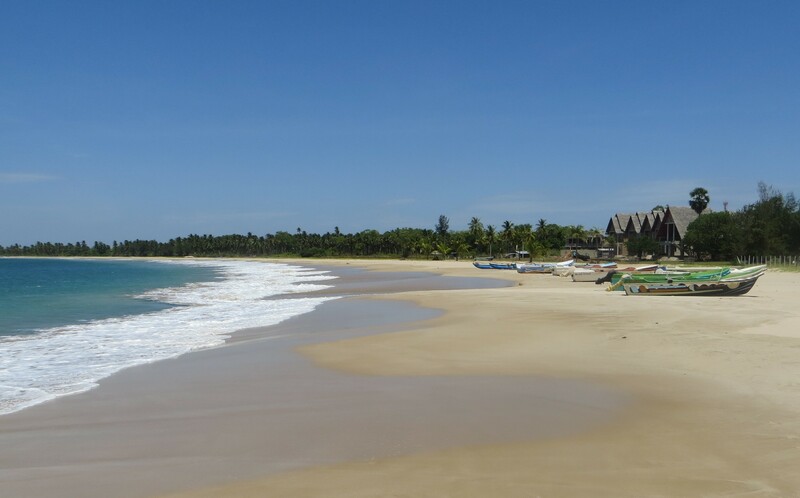 We book the Ocean Front Hotel for our final two-night stay in Colombo, Sri Lanka. Yes, this is where we have butlers. We miss them. Now, we smile and share happy feelings like old family friends. How cool is that? Thank you Abundant Universe. See you in Mumbai! Ahhh, wanna be there. 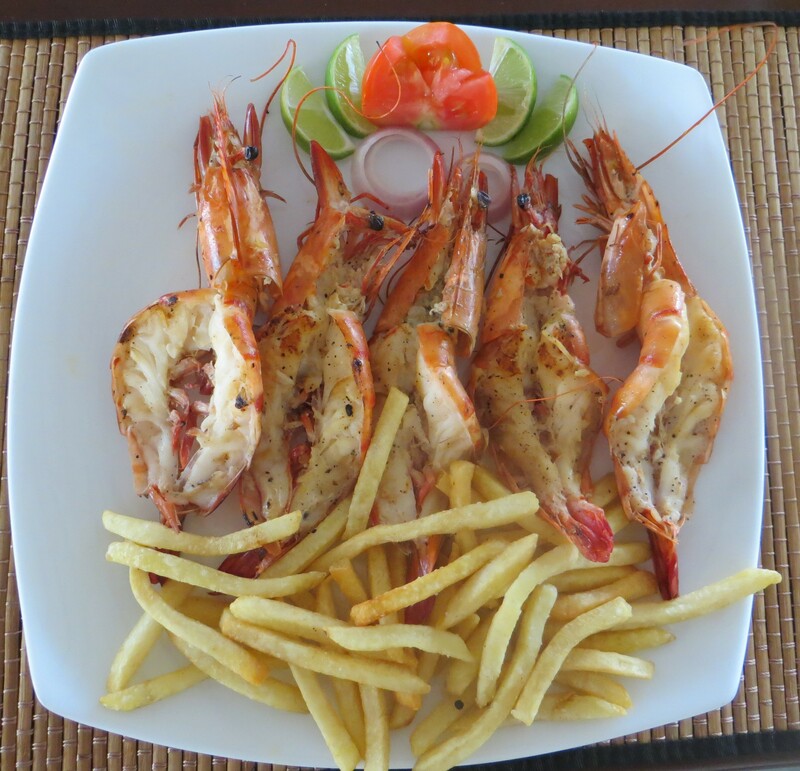 Those shrimp look incredible. Thanks for the vicarious vaca. 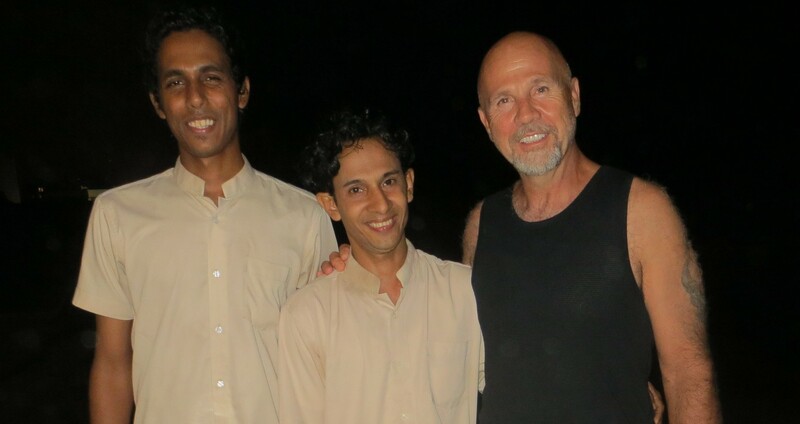 Nice meeting you on Kalkudah beach. Interesting to share our views on traveling and religion while drinking big bottles of beer. It did expand our world (as to include off places as Alaska and Mongolia). Maybe we’ll catch up in Zanzibar or Spitsbergen. We just got home. Had jungle (I forgot the name), city (Colombo) and an imitation of ancient English country life at the Hill Club (cold). The book I referred to (the French guy that lived on the Bajkal shores is apparently translated. http://www.theguardian.com/books/2013/jun/01/consolations-forest-sylvain-tesson-review. I liked it a lot. Yes, we enjoyed meeting you too. Amazing that we had the place practically to ourselves. Glad that you and family had safe travels. I write from Delhi, and hope to be in Nepal in several days. Thank you for the book reference, I shall check it out. See you someday in Zanzibar!